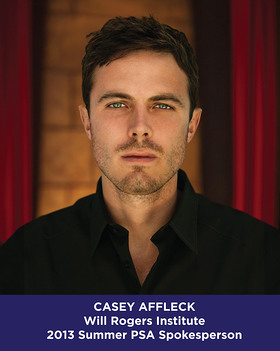 The Will Rogers Institute (WRI) has announced Casey Affleck as its 2013 Summer Theatrical Fundraising Spokesperson. The fundraising campaign, happening right now in participating movie theaters across the United States, is a time-honored tradition that began in 1936 and featured James Cagney, Humphrey Bogart and Bette Davis in its first public service announcement. Throughout the summer, movie patrons have the opportunity to donate to WRI by buying a special combination pack at the concession stand, purchasing a personalized pinup for a display board or “rounding up” their total purchase and donating the spare change to a great cause. The money funds pulmonary research, medical school fellowships, neonatal ventilator equipment for premature infants and free health educational materials. Theaters known for participating include ACT V Theaters, AMC Theatres, Bow Tie Cinemas, Carmike Cinemas, CineMagic, Cinemark USA, Clearview Cinemas (Bow Tie Cinemas), Digiplex Destinations, Goodrich Quality Theaters, iPic Theaters, Malco Theatres, Marcus Theatres, National Amusements, Paragon Theaters, Phoenix/Big Cinemas, Rave Cinemas (Cinemark USA), Regal Entertainment Group, ShowPlex Cinemas (Starplex Cinemas), Southern Theatres, United Drive-In Theatre Owners Association and Wehrenberg Theatres. Casey Affleck’s acting career has spanned 25 years. He is well-known for his role in the ensemble cast of the “Ocean’s Eleven” series as well as for starring with his older brother, Ben Affleck, in such hits as “Chasing Amy” and “Good Will Hunting.” Casey garnered critical acclaim for his Academy Award-nominated role in “The Assassination of Jesse James by the Coward Robert Ford.” He is married to Summer Phoenix (Joaquin Phoenix’s sister) and has two sons. The Will Rogers Institute is a program of the Will Rogers Motion Picture Pioneers Foundation – a charity named after one of the greatest humanitarians, philanthropists and entertainers, Will Rogers. Originally a hospital for tuberculosis-stricken vaudevillians, The Will Rogers Memorial Hospital became a national training facility for doctors treating patients with tuberculosis, and the Will Rogers Institute was created. Currently, the WRI perpetuates the legacy of Will Rogers through a national charitable health program dedicated to the support of research in debilitating lung disorders, medical school training fellowships and the distribution of free health educational materials to the general public; it recently became a national leader in providing lifesaving neonatal ventilator equipment to hospitals throughout the United States. For more information, visit www.wrinstitute.org.